Hopes were high for a scorching seaside weekend as 22 RS800s rocked up to Stokes Bay in shorts and t-shirts. However a chilly South Westerly and a lot of cloud inversion causing poor visibility and no sunshine, forced a hasty retreat into jumpers and jeans. But we were not to be deterred! 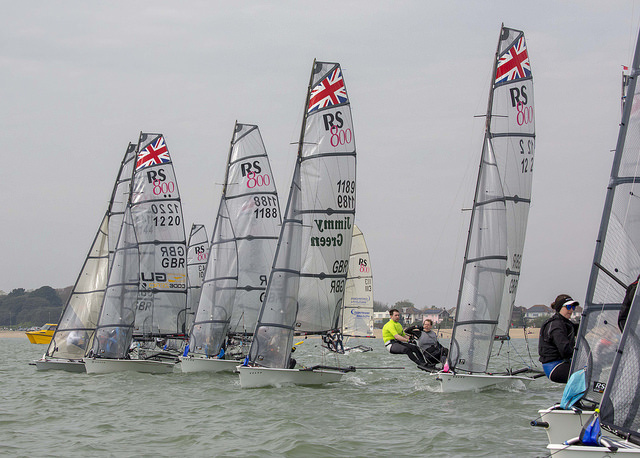 And after much changing room debate, about Summer or Winter wetsuits and whether or not to wear a spray top, and a short postponement onshore while the wind filtered down from the West Solent, racing kicked off. 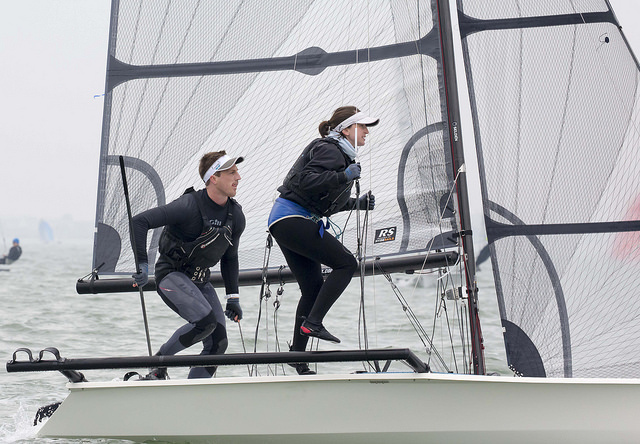 With a “just about twin wiring” breeze, Race 1 saw a battle for first place between old timers Luke and Emma McEwen, and relative new kids on the block Thomas Morris and Guy Fillmoree The McEwens, true to form, were first across the line in tricky racing conditions. Race 2 caught half the fleet off guard as the committee boat changed the starting order, moving us before the B14s. Those paying close attention to the flags (or being told by friendly B14s!) made it across the line in clear air and the fleet split up the beat, some preferring more breeze offshore and others choosing helpful lifts inshore. Luke and Emma crossed the line first, followed by Hugh Shone and Hannah Tattersall who had Steve and Sarah Cockerill, Stokes Bay locals, on their tail. A rain squall, causing 11 Musto Skiffs to fall over, put an end to the day’s racing and we made our way back to land in pursuit of a cold beer. The evening curry and quiz night at Stokes Bay were great fun... although some clarity is still required over a questionable clay Lionel Richie model. Sunday started off a lot more hopeful – the sun was shining, we could see the island again and the wind had swung round to the South West. However, a variable breeze caused slight delay and after watching the Mustos head right up the course and inshore out of tide, Race 3 started with most of the fleet following suit only to be caught out by a cheeky left hand shift. 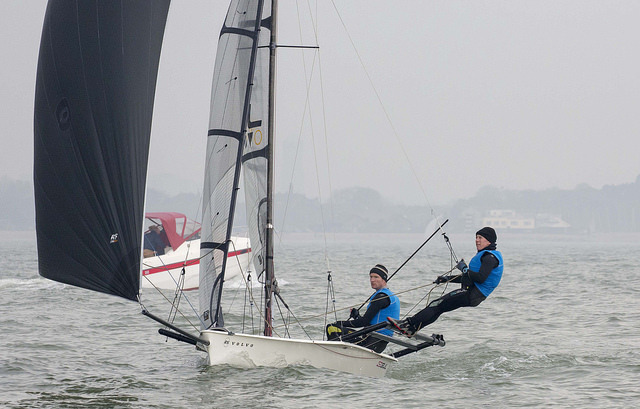 Thomas and Guy led the fleet around the top mark, followed by Luke and Emma and Andy Blundell and Maddie Fenner who were both on the right side of the shift pattern. In hot pursuit were Sophie and Ralph Singleton and John Booth with Alex Benfield, who battled it out around the race course to finish 3rd and 4th respectively. Thomas and Guy lost out to Luke and Emma, finishing a close 2nd. 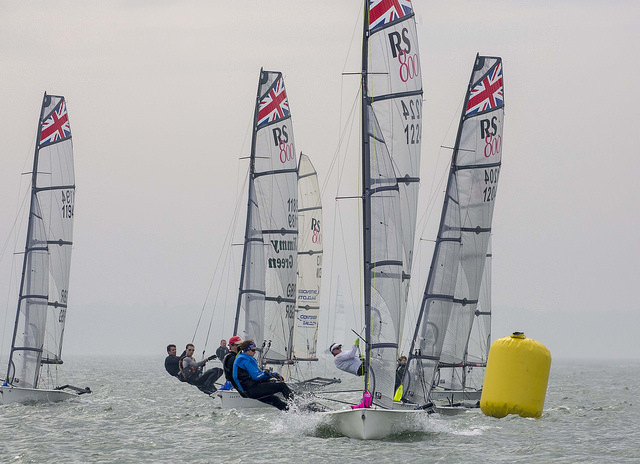 After a brief postponement due to wind shifts, the second race got off to an interesting start. The fleet headed in shore again escaping the tide. But those of us who had completely messed up our starts and were miles behind caught a lucky lift up the course and laid the mark in one. 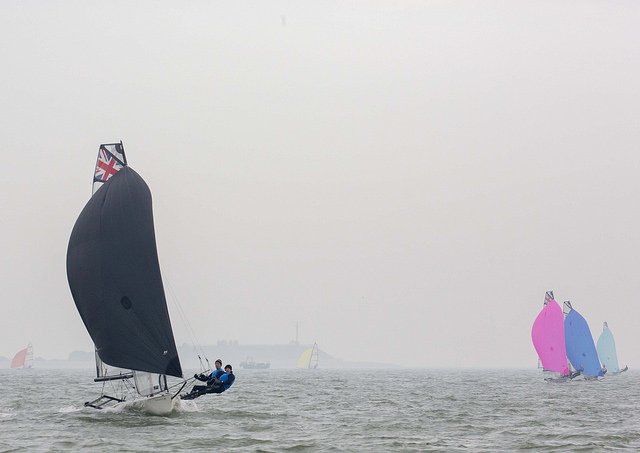 Martin Orton and Ian Brooks led the pack and despite getting tangled up in fleet of Mustos downwind they kept their lead to the finish and had a fantastic first RS800 race win! Andy and Maddie who were last over the line but second at the top mark, held their position and Luke and Emma, after clocking onto the shifts, secured third place. The final race of the day took a while to get started as the race committee moved the marks to the left then back to the right and finally about 30 degrees left as the wind settled and built. 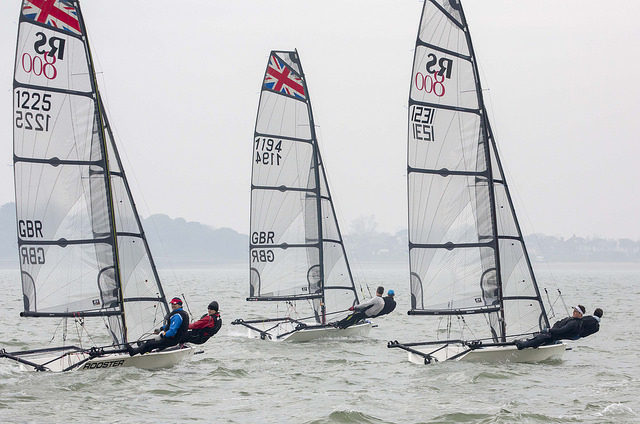 A bad start and mark rounding from Hugh and Hannah saw them nearly throw the towel in, but thankfully they kept it together and climbed through the fleet to finish third. 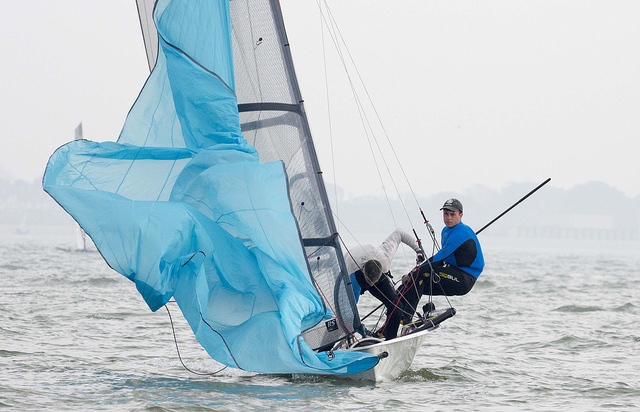 Thomas and Guy got back up to pace and took the inshore route downwind to win the race, followed by the McEwens in second place. Andy and Maddie finished 4th after avoiding a wind hole on the right hand side of the course, which sucked in Chris Dodd and Bryony Meakins and Dan Goodman and Debbie Clark among others. Feeling tired but happy, the fleet headed back to shore after a good day on the water. 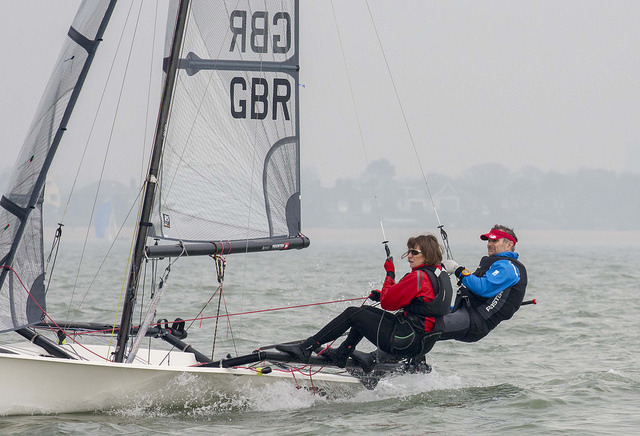 Alistair and Penny Shires took the endeavour trophy for completing every race on the water and looked like they had really enjoyed themselves! Luke and Emma won the open event proving a little bit less meniscus on your knee cap doesn’t stop you from taking top position. 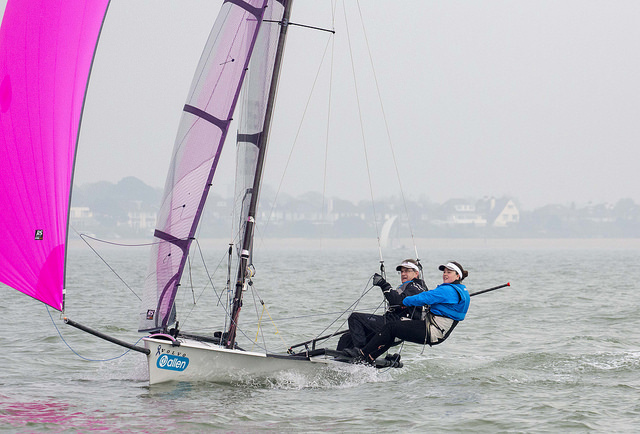 Thomas and Guy had a great weekend on the water and comfortably secured second, and Andy and Maddie finally made it into the prizes in third place. Thanks to Stokes Bay for putting on another great event and to everyone for turning up! It was great to have 22 boats on the water. We look forward to seeing you at Datchet Water SC 12-13 May for the next RS800 Rooster National Tour event.